In this step, you will run the User Agent and send your data file to JSMDirect. A LANSA function will be invoked to process your data and send back a response. 1. Ensure that your Web server and JSM Server are started. 2. Open Integrator Studio if necessary and double click on Projects/iii Training to open your project in a new tab. 3. 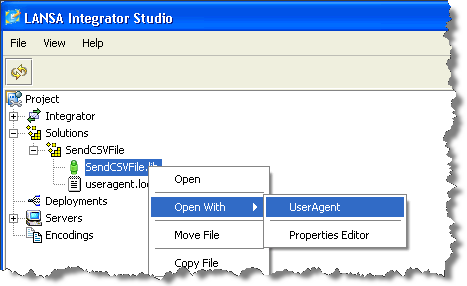 In the Project tab, open Solutions/SendCSVFile and right click to Open With the User Agent. 4. The User Agent has opened using the Host Configuration file (.lih) which you defined earlier (shown in the Title bar). Use the Open toolbar button (highlighted above) to open your CSV file. 6. Using the File menu, select the Send option, or use the toolbar button. 9. You can view the response from the server by clicking on the Response tab. The image below is what you will see when you click on the Response tab. 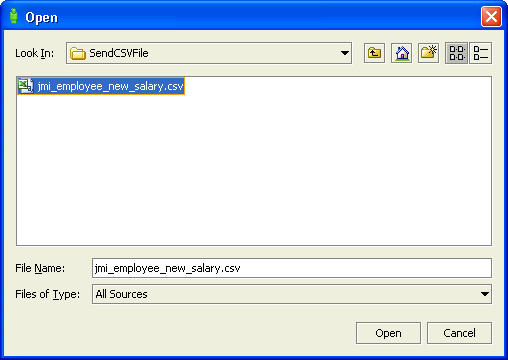 10.If you right mouse click on the table, you can save the response as a .CSV file.